More photos from Day Three in another post. In order to select a specific record collection on FamilySearch, go to https://familysearch.org/search/collection/list and use the "Filter by collection name" feature in the upper left-hand corner and use a keyword (e.g. "church england") to find collections with those keywords..
Day Two at Jamboree 2018 was busy - I went to three classes (out of six time slots), walked around the Exhibit Hall a bit, had an interview, took a nap, blogged a bit and took Linda out for dinner. Linda spent about five hours in the swimming pool. We had breakfast in the blogger lounge cafe, I had a banana and muffin, and Linda had a bagel. My 8:30 a.m. class was "Bankruptcy to Equity: Using Federal Court Records" by Michael L. Strauss. This was interesting because I have not used any of these records to date. Michael's examples were excellent. I took a quick spin through the Exhibit Hsll and then was off to the 10 a.m. class on "The DNA of the British Isles" by David Nicholson of LivingDNA. The class was full, and I sat in the back so I couldn't see all of the details on the slides. I had not heard of the Elmet Resistance in the 600 AD time frame in West Yorkshire, and I did not know that the Norman invasion in 1066 had little effect on British Isles DNA. At 11 a.m., I found Linda in the pool and we had lunch in the breezeway between the buildings. After lunch, I went into the Exhibit Hall and took photos, talked to Crista Cowan of Ancestry about the search problems (I think she said they are still using two different server systems for global searching, but the search of specific databases works fine. She didn't know if all of the problems were fixed by the 31 May date) and the Member Tree indexing issue (she said this will be done when everything has been transferred and tested). I posted my Day Two photos in Randy at Jamboree 2018 - Day Two Photos. I came back to the room at 12:30 and updated my blogs. At 1:30 I went down to the Boardroom and was interviewed by Andy Lee for the Family History Fanatics YouTube channel. I went to Craig Scott's excellent talk on "The French and Indian Wars" and learned a lot about colonial history from colonization to independence. At 3 p.m. I was back to the room and took an hour-long nap with Linda. Then I worked on my blogs until she woke up. * We went off to dinner at 6 p.m. to Don Cuco's in downtown Burbank. It was fast and good and relatively cheap. We were back to the hotel by 7:30 and I worked on the Photo post and this post. Saturday is the last day of the conference. My Day 3 blog posts will be late (Sunday?) because we are leaving early to see my daughter's family on the way home. 2120. John Hubbard, born 1630 in England; died before August 1702 in Hatfield, Hampshire, Massachusetts, United States. He was the son of 4240. George Hubbard and 4241. Mary LNU. He married about 1649. 2121. Mary Merriam, born about. 1630 in Hadlow, Kent, England; died 08 March 1721 in Hatfield, Hampshire, Massachusetts, United States. * John Hubbard (1655-1748), married 1676 Mary Wright (1663-1741). * Jonathan Hubbard (1659-1728), married 1681 Hannah Rice (1658-1741). * Daniel Hubbard (1661-1744), married 1683 Esther Rice (1665-1738). * Mercy Hubbard (1664-???? ), married 1685 Jonathan Boardman (1660-1712). * Isaac Hubbard (1667-1750), married 1692 Anna Warner (1669-1750). * Mary Hubbard (1669-1754), married Daniel Warner (1666-1754). * Sarah Hubbard (1672-1754), married 1698 Samuel Cowles (1673-1750). 4242. George Merriam, born about 1602 in Hadlow, Kent, England; died 29 December 1675 in Concord, Middlesex, Massachusetts, United States. He was the son of 8484. William Merriam and 8485. Sarah Burges. He married 16 October 1627 in Tonbridge, Kent, England. 4243. Susan Raven, born about 1606 in Kent, England; died 08 October 1675 in Concord, Middlesex, Massachusetts, United States. * Mary Merriam (1630-1721), married (1) 1649 John Hubbard (1630-1702); (2) 1705 Sampson Mason. * Samuel Merriam (1643-1705), married 1669 Elizabeth Townsend (1648-1705). * Charles Henry Pope, Merriam Genealogy in England and America (Boston Mass. : n.p., 1906). I have done no original research on this Merriam line. That's all the photos I took today - I'll try to remember to take more tomorrow of other exhibitors and maybe some genea-blogging friends too! * Archived Family Tree Webinar: The Palatine Immigrants: Tracing and Locating 18th Century German Immigrants Online by Luana Darby. * Family History Fanatics YouTube: How do you begin tackling a difficult genealogy problem? Did you miss the last Genealogy News Bytes - 29 May 2018? Were your catholic ancestors baptised in the Archdiocese of Chicago in Illinois? Over 1.2 million additional Sacramental registers dating from the mid-1800s up to 1925 have been added to our existing collection of Chicago Catholic Baptisms. Records will reveal the date and location of your ancestor's baptism, the names of their parents and their residence. Each result will provide a transcript and image of the original baptism register. The Archdiocese of Chicago was first established as a diocese in 1843 and later as an archdiocese in 1880. It serves the Catholic population of Cook and Lake Counties in north eastern Illinois and consists of 6 vicariates and 31 deaneries. Explore over 597,000 additional parish marriage records covering the Catholic population of Cook and Lake Counties in north-eastern Illinois. Each result will provide a transcript and an image of the original marriage register that may reveal the couple's marriage date, marriage location, the names of their parents and the names of any witnesses. 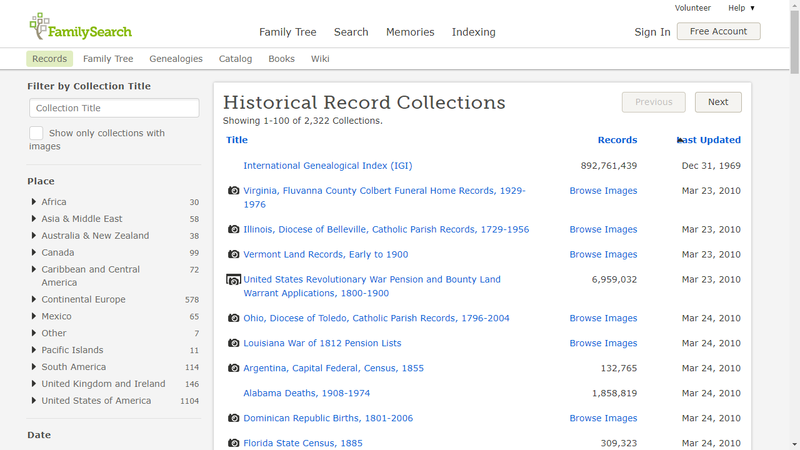 Search over 229,000 recently added burial records to discover when and where your Catholic ancestors were laid to rest. Images may reveal additional details such as cause of death, residence, place of birth, father's name, mother's name and the name of the priest who conducted the service. During the nineteenth century, Chicago was one of the fastest growing cities in the world, the population increasing twenty-fold between 1860 and 1910 to make it the fifth largest city in the world. Chicago was a veritable boomtown, with its population swelling with emigrants from Europe; Czech and Polish emigrants represented a large proportion of this growing population. Our collection of Chicago Roman Catholic Parish Registers is now available to browse. Our browse function enables you to delve through original registers of baptisms, marriages and burials page by page. Were your ancestors members of a Catholic congregation in Chicago? Explore more than 430,000 assorted congregational records from across the archdiocese to uncover vital biographical details as well as where and when your ancestors worshiped. Over 43,000 additional records covering schools in County Mayo have been added to our collection of Ireland National School registers. The entire collection now contains more than 186,000 records from many areas of the country spanning the years 1860 to 1922. School registers can reveal a variety of details related to your ancestor's schooling. Records may reveal how they did in school, how good their attendance was, how old they were and what their parents or guardians did for a living. These registers, from schools that have since closed down, give a fascinating insight into the multidenominational early school system and can be a valuable resource for genealogists. Please note, however, those images that include individuals born after the 100-year cut-off have been redacted; therefore, some entries only include a transcript. Over 33,000 additional records have been added to our collection of Scottish Memorial Inscriptions. The collection includes records from 14 Scottish counties including the Isle of Skye and 209 burial grounds. A full list of the burial grounds, organised by county, found in Scotland monumental inscriptions index can be found through the link provided in Useful links and resources. In this index, you will find burials as early as 1507, like Robert Graham buried at Kinneff church in Kincardineshire, and as recent as 2016, like Morag Hamilton buried in Carmichael cemetery in Lanarkshire. Disclosure: I have a complimentary subscription to Findmypast, and have accepted meals and services from Findmypast, as a Findmypast Ambassador. This has not affected my objectivity relative to Findmypast and its products. This was a fairly full day for me at the SCGS Genealogy Jamboree. 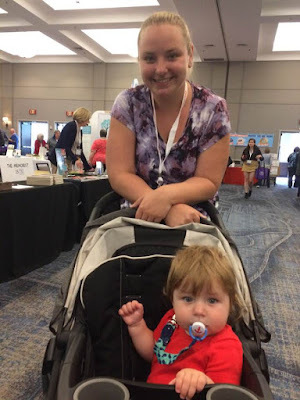 Thursday was the day for the JsmboFree, Genetic Genealogy and the Family History Writers Conferences. I didn't sign up for the latter two, but do have access to the syllabus materials because I did sign up for the Genealogy Jsmboree Conference on Friday and Saturday. Thursday started with an expensive and unsatisfying breakfast in The Daily Grill - scrambled eggs and tomato slices shouldn't cost $14. Linda could 't eat the bagels in the blogger lounge so we ate at the restaurant. Slow and expensive. Did I mention expensive? I thought so. After breakfast, I walked over to the Pavilion where Barbara Randall was setting up her Genealogy Basics class. They were still setting everything up when I got there. I was one of the two room monitors for Barbara, and that went OK. We had about 80 attendees, and my job was to hand out the Beginner's Kit and tell them to fill out the card for door prizes, and then Sheryl and I collected them. I got to give the welcome talk and tell folks to turn off their cell phone ringers and the rest, and Sheryl introduced Barbara. She did two sessions in 3 and a half hours, and we had a break in between. She had eight door prizes to give out. In the middle of the second session, the fire engine and ambulance drove up to the convention center, and took a fellow on a gurney who had a health problem. Not the first time that's happened, I'm told. At noon, I headed over to the room and picked up Linda and we went to the lunch area between the buildings. I had a hamburger and chocolate chip cookies, and she had a turkey sandwich and chips. We then went to the Exhibit Hall and walked around. The 23andMe booth had a wheelspin for a chance at a DNA test, and other prizes. We got a kids book on DNA. I can use that! During the afternoon, I had discussions with a number of friends and colleagues about many genealogy subjects; I told several folks about my recent DNA match success. I recall talking to Dallan Quass of RootsFinder, Steve Caguiat of FamilyTreeMaker, Daniel Horowitz and team of MyHeritage, Lisa Louise Cooke, Cynthia Richardson of Genlighten, Bruce Buzbee of RootsMagic, and Ray Raser of the Mayflower Society. There are many more people to visit in the Exhibit Hall the next two days. We got to meet James, the cute 10-month old son of Elyse and Jesse, and got a photo of them. He liked having his toes tickled. At 6 p.m. I went down to help Linda out of the pool, and she took a shower and we went to dinner at 7:15 at the Daily Grill because it was late. She can only eat salad for dinner there because of her allergies. We both had a crappy Cobb salad - too much small lettuce bits and not enough of the goodies, for $22 each. Plus a drink. The sourdough bread was the best part of the dinner. So another crappy meal at the Daily Grill for an exorbitant price. Captive audience. You' think we would learn. Where to go tomorrow for dinner? No clue. Then it was back to the room and I'm blogging away before bed. That's Day One - I enjoyed the discussions in the Exhibit Hall and seeing many geneabloggers and Genea-Musings readers during the day. It's time for another edition of "Seavers in the News" - a semi-regular feature from the historical newspapers about persons with the surname Seaver that are interesting, useful, mysterious, fun, macabre, or add information to my family tree database. "The funeral of Dr. Lewis s. Dixon, Boston, oculist, who died Sunday night at the Charlesgate Hotel, wioll be held at the Forest Hills Chapel at 3 o'clock tomorrow. He was 78 years old, and since 1891 had been associated with his cousin, Dr. robert B. Dixon, at 232 Clarendon street. "He was a native of New York, and was the son of Dr. Rufus E. Dixon who practiced dentistry in Boston for 50 years. He was a graduate of Harvard, class of '68, and later studied at the Harvard Medical School, from which he was graduated in 1869. He was a member of the Harvard Club. He is survived by a son, Prof. Roland Burrage Dixon, who is attached to the anthropological department at Harvard. His wife, who was Miss Ellen R. Burrage, daughter of William Burrage of boston, died 10 years ago." "Dr. Lewsi S. Dixon," Boston [Mass. Herald newspaper, 7 August 1923, page 12, column 1, Lewis S. Dixon obituary; digital image, GenealogyBank (www.genealogybank.com : accessed 24 May 2018), Newspaper Archives collection. Why is this post about a Dixon and not a Seaver person? Well, Lewis S[eaver] Dixon was born a Seaver, as explained in the post last week of Seavers in the News - Roland Burrage Dixon Death in 1934 in Boston. I wondered if there would be an obituary for Lewis S. Dixon, and I found it on GenealogyBank. I wondered if it would mention that he was born a Seaver. It didn't. The obituary names his step-father, Rufus E. Dixon, as his father. Rufus Dixon (1816-1897) married Susan Waters (Dixon) (Seaver) Dixon (1825-1909) before 1855 probably in Massachusetts, as his second wife. Lewis Seaver Dixon (1845-1923) is still my 6th cousin 4x removed, since his birth parents were Lewis Wheaton and Susan Waters (Dixon) Seaver, who married in 1844.